Planning a trip to one of the Lake Atitlan towns? 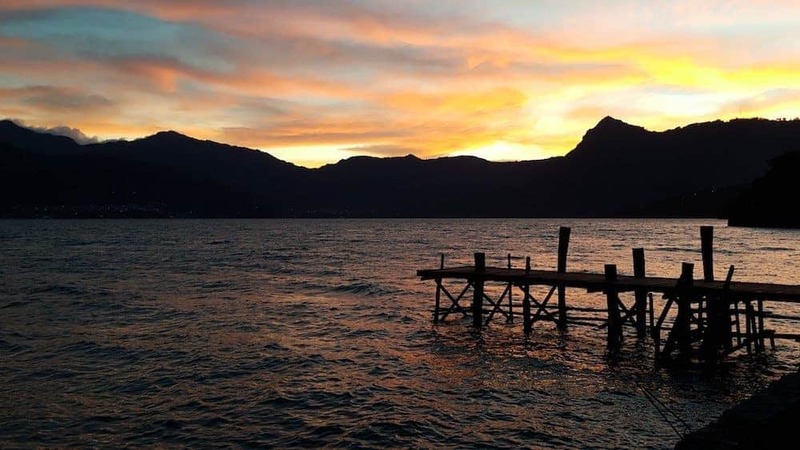 Lake Atitlan has the power to leave people speechless. The lake, surrounded by volcanoes, has a magical feeling. And yes, it’s very Instagrammable. I heard that’s an interesting word these days. Lake Atitlan is a volcanic crater lake in the Guatemalan Highlands in Central America and it’s one of the reasons people visit Guatemala. The banks of this crater lake are awesome for stunning sunsets and the area invites to stay forever. The Lake Atitlan towns and villages are drenched in a hippie and backpacker vibe. Those who come here and have time to spare will probably stay a long time. The speed of living isn’t very high and this is the perfect place to escape the rat race. Surrounded by dozens of rural villages and guesthouses, Lake Atitlan has something for every budget. If you don’t feel like traveling by yourself, you can always join a tour to visit the Lake. On my first visit to Guatemala, I joined this awesome tour that has an authentic homestay in one of the villages of Atitlan. 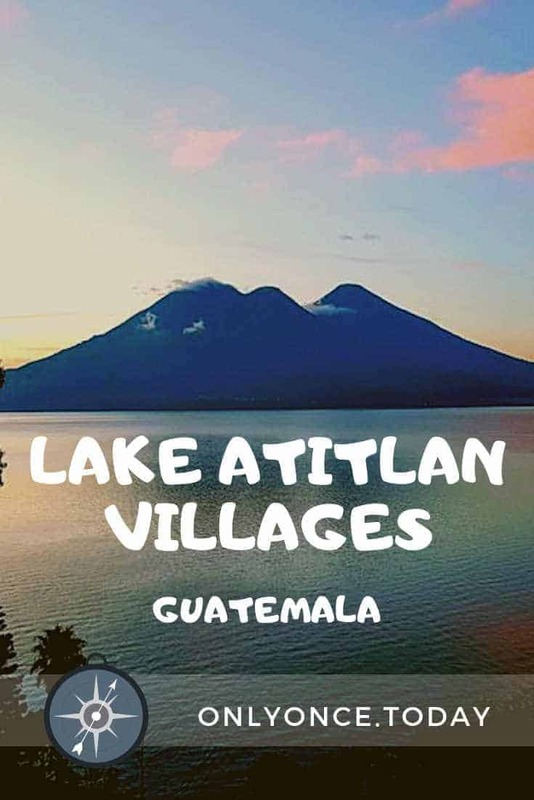 Keep reading to find out which are the best villages at Lake Atitlan. 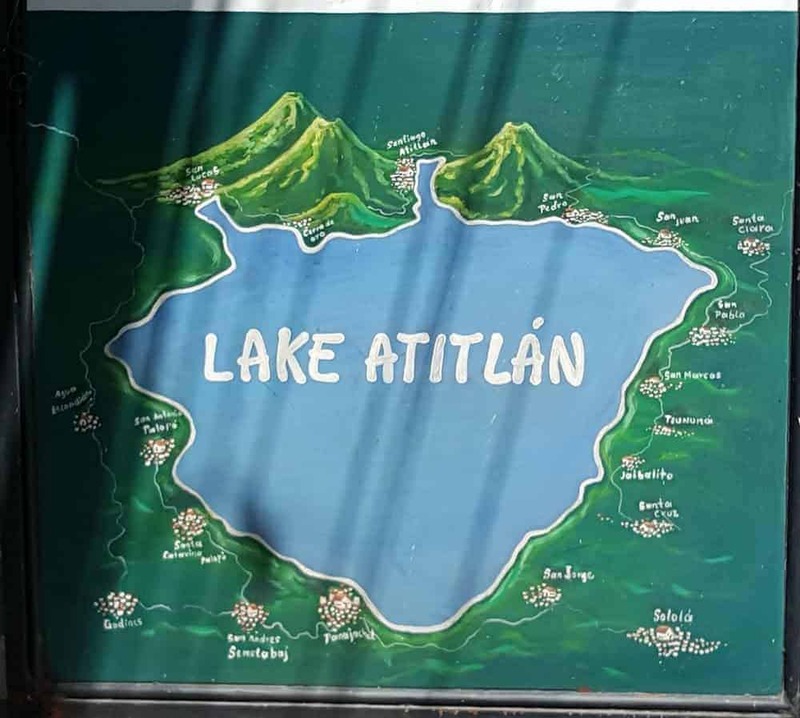 And of course, we also talk about the best Lake Atitlan hostels and the other options for where to stay in Lake Atitlan! We also sum up the best things to do in Lake Atitlan. 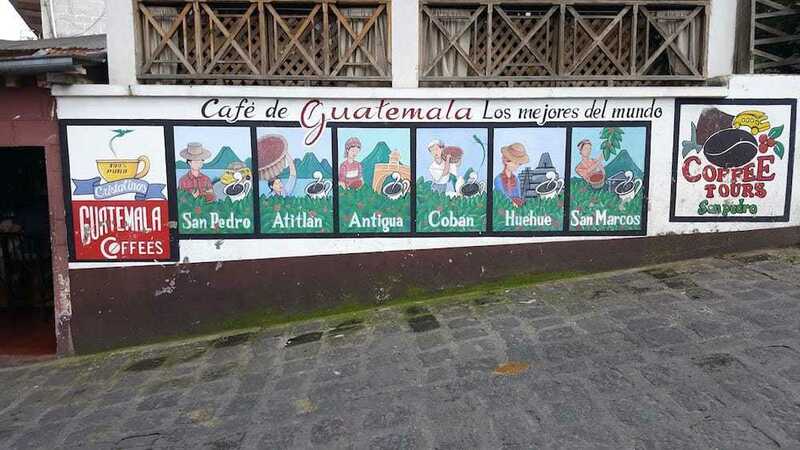 Don’t forget to read this post with things you should know before traveling to Guatemala and these reasons to visit the beautiful country! Panajachel is the place where you probably arrive in the area. It’s the largest town with more shops, restaurants, and bars. Cafe’s on the waterfront offer amazing sunset views, so they’re perfect for a few drinks in the evening. 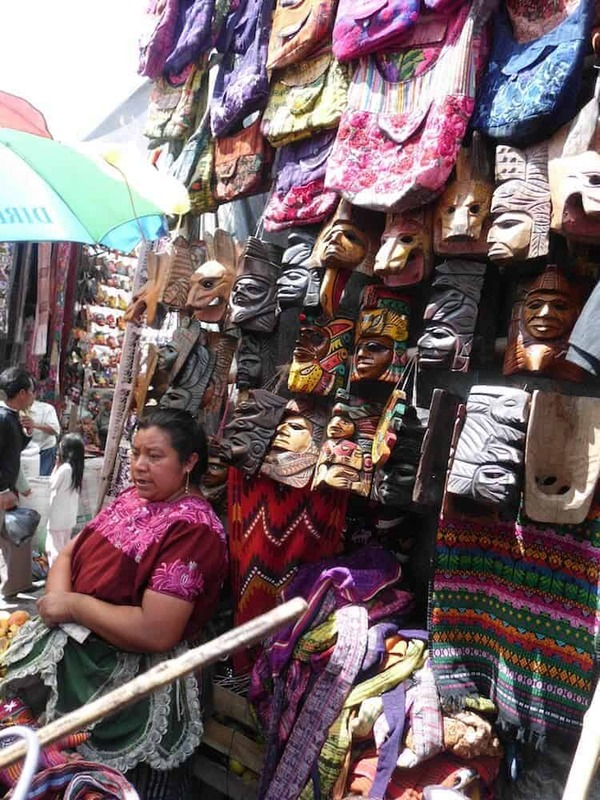 Panajachel has a lively city center and it has the biggest market on the lake. 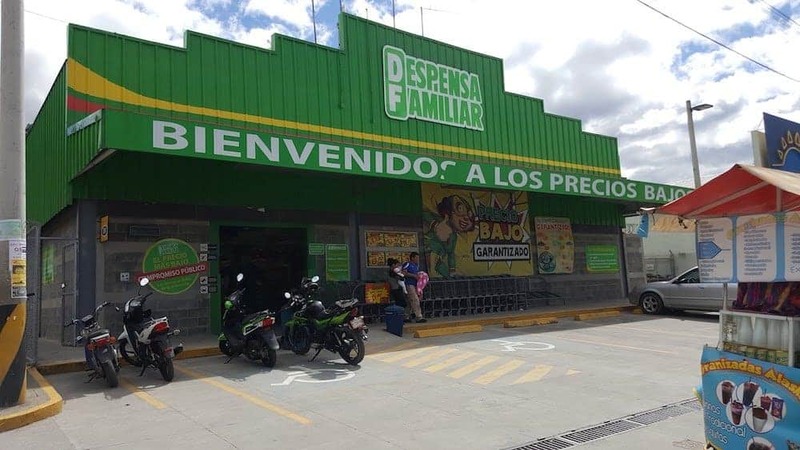 We also visited Panajachel when we needed a supermarket. In Panajachel, you can find multiple ATM’s. They basically sell the same stuff as the shops in the villages, but prices are more reasonable in the Dispensar Familiar in Panajachel. 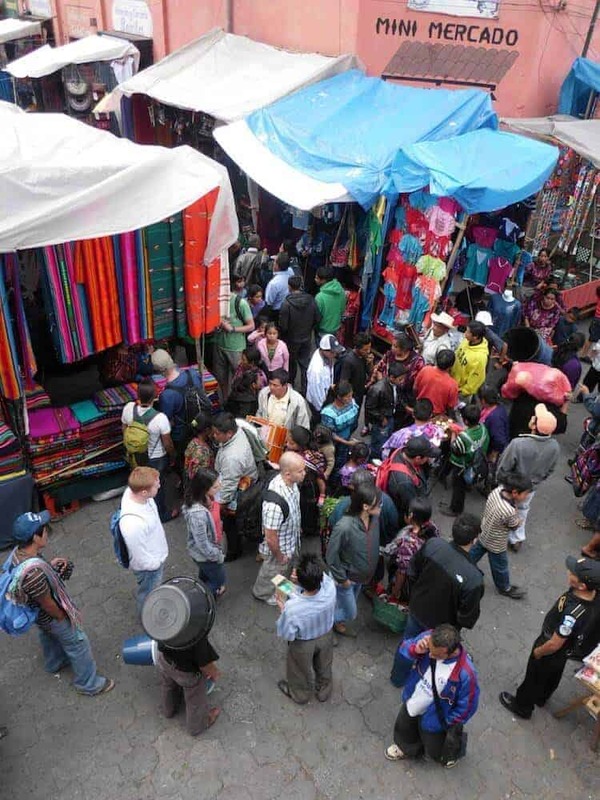 The town is especially busy on weekends when Guatemalans visit the region. Just outside of Panajachel, the Reserva Natural Atitlan is a beautiful place to spend a few nights. On the domain, you can also go ziplining and engage in other sports activities. This accommodation is great value for couples, as well as families with kids who travel to Lake Atitlan. Villas in Jucanya is also located right outside of Panajachel on the shore of the lake. It costs just a little more, but you get a lot in return for your money! For budget travelers, Hotel Victoria is right in the city center of Panajachel. It’s quite cheap, and it gets great reviews from travelers. PanaHouse and ABU hotel are both budget hostels in Panajachel. Both offer private rooms, as well as, dorm rooms and they tend to sell out quickly! San Pedro is a backpacker town that attracts the most visitors of all. So this is about the busiest of all the towns on Lake Atitlan. It might even be one of the best towns to visit as a backpacker or if you want to study Spanish. You can find a lot of hostels, bars, and restaurants here. San Pedro Lake Atitlan is slightly cheaper than the other villages, so most budget backpackers reside here. The tourist part of town is by the waterside. Further up the hill is the real San Pedro, which is quieter and more rural. A lot of backpackers never leave the lakeside roads. From San Pedro, you can hike up the San Pedro volcano for amazing views of the town and the lake. 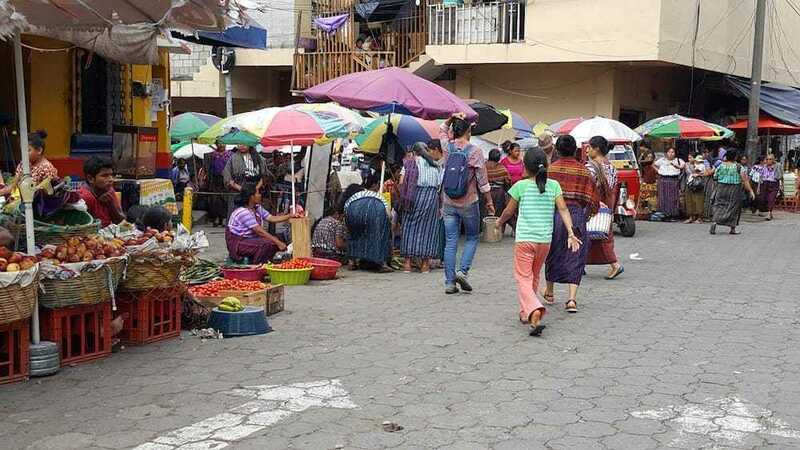 In San Pedro, you can find 2 ATM’s and a local market with fresh vegetables. The town is also home to many Spanish Schools. We studied at the Community Spanish School and definitely recommend studying in this school. Wachalal Lake Lodge is one of the best lodgings in San Pedro. 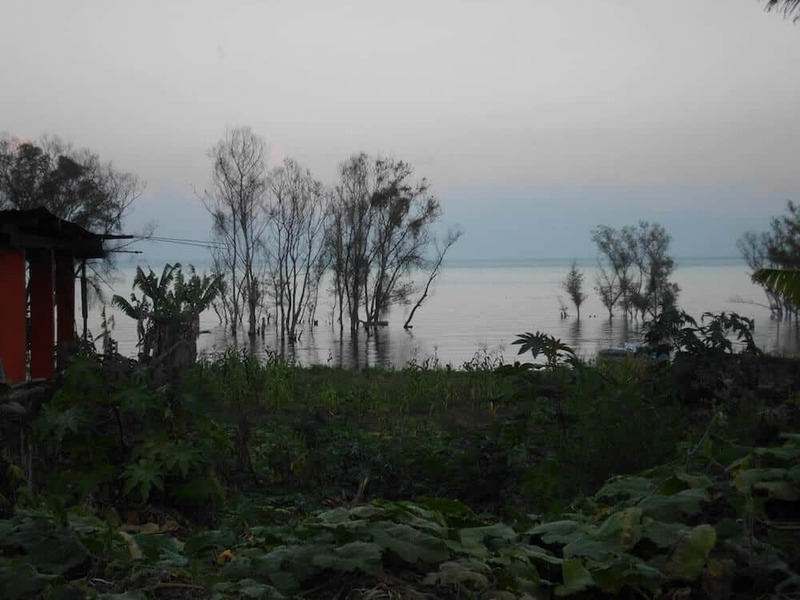 Prices are great and the place has a garden and rooms with lake view. This is your best choice in San Pedro for romantic accommodation. For backpackers and budget travelers, Mikaso Hotel and Restaurant is the most popular San Pedro Hostel by far. Makaso has dorm beds, as well as, private rooms. Jarachik is another great hostel/hotel in the popular backpacker area in San Pedro. You can get a dorm bed or a private room in this hostel. San Marcos Lake Atitlan is a laid-back town by the water where a lot of hippies reside. This town is known for yoga classes, vegan restaurants and again… hippies. So if you want to do some yoga at Lake Atitlan or find a yoga retreat, this is the place. Yoga is just one of the things to do in San Marcos La Laguna. You can also engage in some hiking or practice your stand-up paddleboard skills. 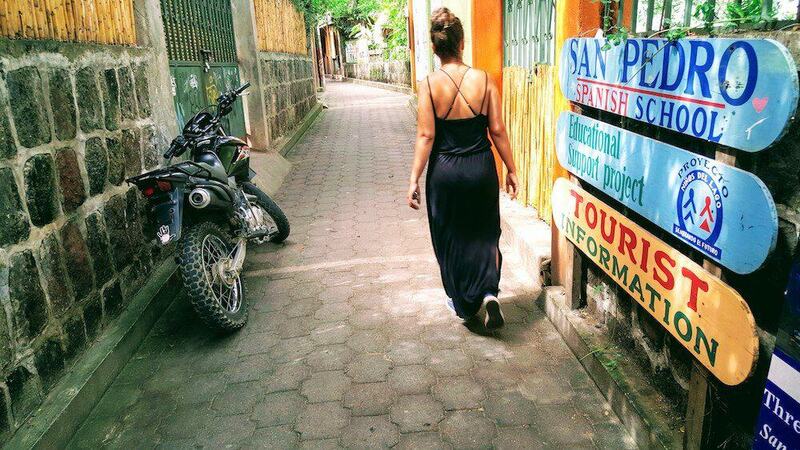 It has a very relaxed vibe and most of the backpackers who never seem to leave the area can be found in San Marcos La Laguna. We stayed at a marvelous Lake Atitlan rental near San Marcos with the option to walk or take a lancha to San Marcos. San Marcos Atitlan has the best views over the lake and it’s one of the best places to stay at Lake Atitlan. The village of San Marcos has 1 ATM, which is located in a grocery store. So yes! There are grocery stores as well! Prices are a little higher than in Panajachel. San Marcos offers some of the best views over the lake. So we recommend staying in San Marcos at least a few nights. Pasaj Cap is a beautiful domain just outside the village and it is our favorite lodging at the lake. Pasaj Cap offers short term and long term Lake Atitlan rentals and the studios, apartments, and houses are amazing. Lush Atitlan lives up to its name! This San Marcos hotel has a fantastic location and it looks amazing! It’s in the village of San Marcos with access to the water. Just a 15 minute walk away from San Pedro or a 5-minute boat ride, you will find San Juan Lake Atitlan. This village is a wonderful place to experience the local culture. You can engage in workshops to learn how the colorful fabrics are woven. After that, you can buy handcrafted fabric, paintings, and other local souvenirs. A lot of the fabrics that are sold in the markets in Guatemala are produced here. Most tourists stay in other villages and come to San Juan on a day trip. But you can spend the night here and experience the rural Lago de Atitlan. The small village has seen a tourism boost in recent years and salesmen are awaiting you at the docks now. You can choose to let one of the sellers accompany you to their store, or you can just say no. They won’t keep bothering you. San Juan has no ATM. In San Juan La Laguna, we recommend staying in Eco Hotel Uxlabil. It’s in the village center and all the rooms have stunning lake views. Santiago de Atitlan is the biggest of the towns on Lake Atitlan. It’s actually large and lively. Most travelers don’t spend the night in Santiago, but you can if you want to. It is, however, less popular than most other villages. 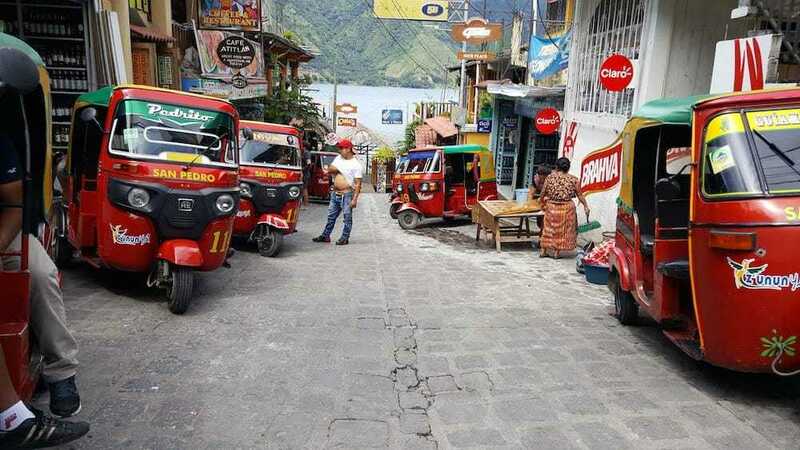 The main reason for visiting Santiago Atitlan is Maximon. This religious icon moves to a new home each year. People can visit Maximon and bring him gifts like food or cigarettes. The local family that hosts Maximon, will see their living room transformed into a semi church. Foreigners can visit Maximon too. You are expected to bring money and/or gifts. Taking pictures will cost a little more. To find out where Maximon is residing, just ask the local kids. They will be happy to walk with you in exchange for a Quetzal or a pen. 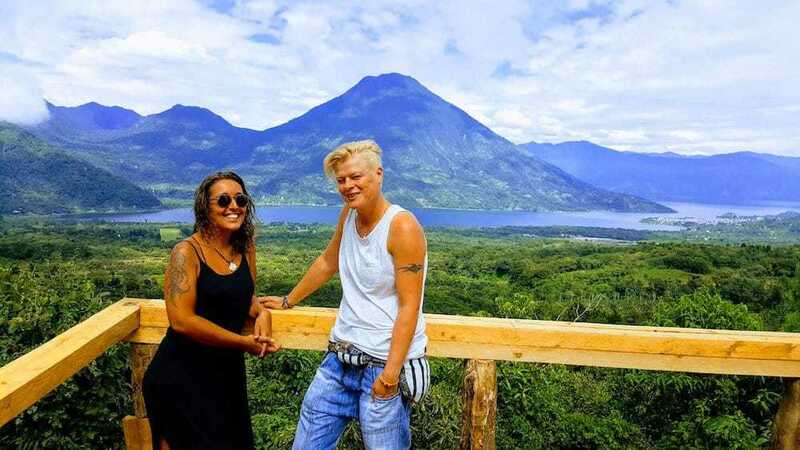 Another cool activity in Santiago is a trip to the viewpoint over Lake Atitlan. We got the chance to drive a tuc tuc by ourselves on our way to the viewpoint! It was a wonderful day trip! In Santiago Atitlan, men, as well as women, wear traditional Guatemalan clothing. In most other cities and towns, only the women wear traditional dress. In Santiago, you can find ATM’s and grocery stores. There is also a market and a church. The village of Santa Cruz is located right in the middle between San Marcos La Laguna and Panajachel. Santa Cruz has a very rural feel and a lot of visitors are day-trippers. But in this village, you get some of the best views over the lake, so it’s definitely worth to spend a few nights in Santa Cruz. There are a few shops by the waterfront, but the rest of this village is very peaceful and quiet. Most visitors are discouraged by the steep climb into town and they stay by the docks. 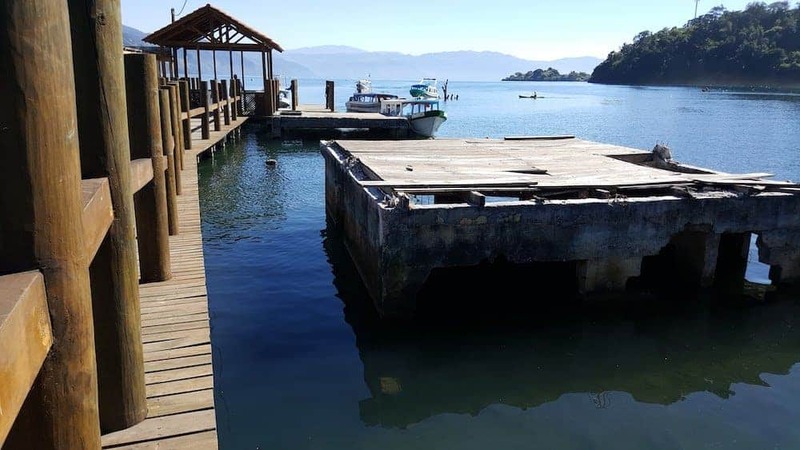 There’s a dive shop in Santa Cruz and the lake is an interesting location to go diving in Lake Atitlan. Santa Cruz is a popular place to spend the night and you can find some of the very best accommodation here. La Iguana Perdida is by far the most popular backpacker hostel around the lake. It’s cheap and good. The Iguana Perdida is a great place to have a party and socialize with other backpackers. At night, you can enjoy regular live music performances. For budget travelers, Casa Kaktus is a beautiful and scenic accommodation option on the lake. The rooftop terrace offers amazing views over the lake and a delicious breakfast is included in the affordable price. If you want to splurge on luxury in a stunning place like Lago de Atitlan, check out this gem: Casa Prana. Particularly know for traditional pottery and fabrics, this town also offers scenic views of the lake and the volcanoes. San Antonio Palopo is easily accessible but usually skipped by tourists. If you want to experience rural Guatemala with fewer tourists and more local culture, San Antonio is a good place to start! You can also engage in workshops in order to learn about local handicrafts here. The town is larger than you might expect! Hotel Nuestro Sueno and Hotel Terrazas Del Lago are both affordable and beautiful Lake Atitlan Hotels in San Antonio. San Lucas Toliman is a rather large town on the lake, but like so many other towns, it’s hardly visited by tourists. This town offers culture and colorful town life. It’s actually a great place to reside for a few days. 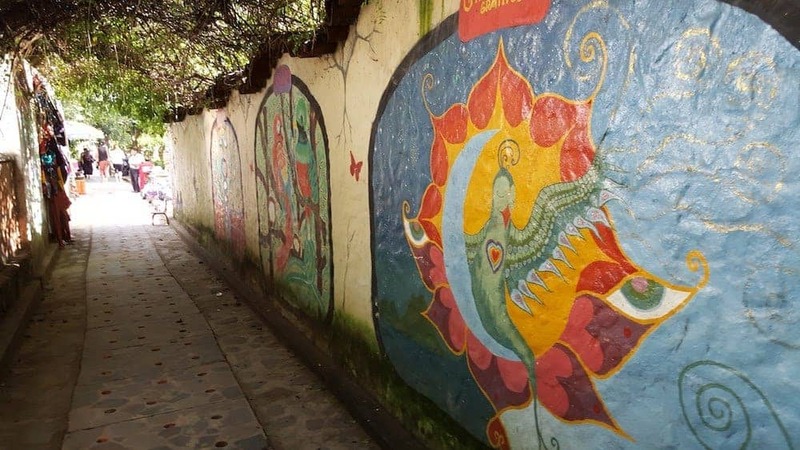 Read this interesting article by Travel Mad Mum about this colorful Lake Atitlan Village. In San Lucas, Hotel Toliman is your best choice! They have a pool, but that’s not all. This hotel also has an awesome restaurant on site. Slow travelers seem to have trouble leaving the lake behind and a lot of people spend weeks or even months in the Atitlan region. 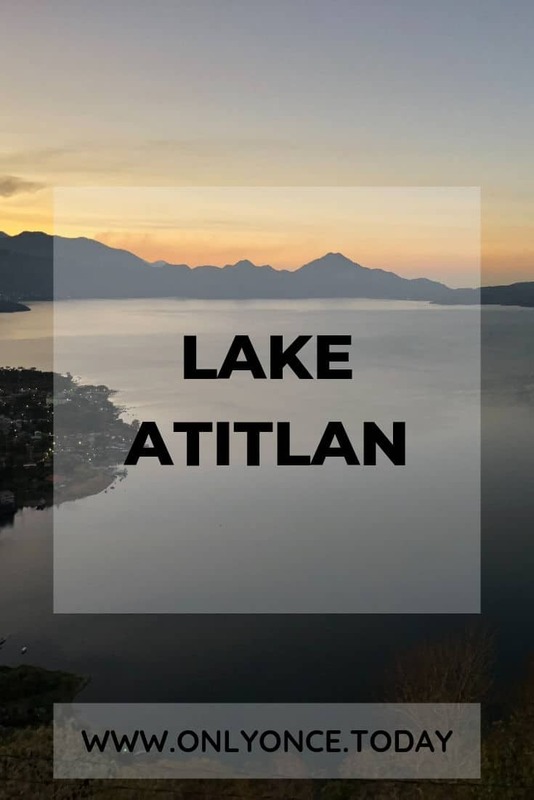 Lake Atitlan is a place to find peace and connect with nature. From the towns of San Pedro and Panajachel, it’s very easy to book a seat for a Lake Atitlan Boat tour. During these Lake Atitlan tours, you usually hop from village to village and learn tons of facts about the lake. Most of the villages are easily accessible by boat and the tour companies have their docking place on the piers. This is a great way to discover the villages in a short amount of time. When in Guatemala, it’s not allowed to miss this market. Chichicastenango is one of the top things to do in Lake Atitlan. Every Thursday and Sunday this huge market is the place to be in the area. There are a lot of tourists trying to get a good price for beautiful fabrics, bracelets and other products. Still, this market had a very local feel. We visited on a day trip from our hostel in San Pedro. 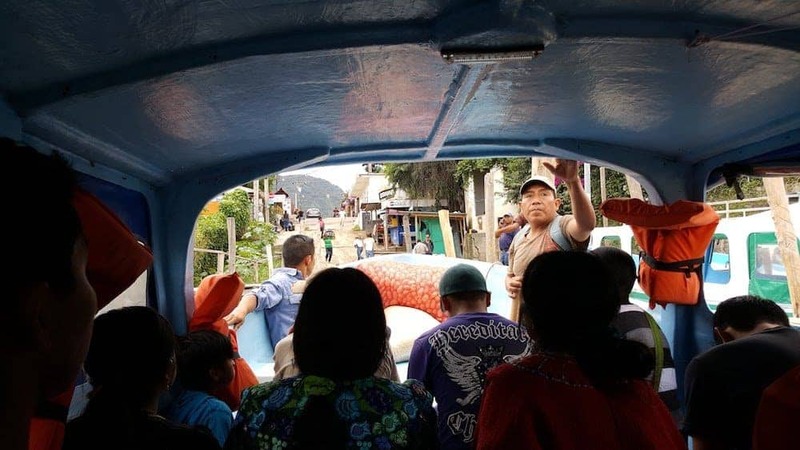 The ride from the villages around Lake Atitlan to Chichicastenango takes about two hours. Right before reaching Chichi, Guatemala police inspected our bus on fruits and vegetables. Not sure why, but everyone who had an apple or a banana lost it that day! We went zip lining close in the Reserva Natural Atitlan near Panajachel. It was a great experience because ziplining is a lot of fun. But even more, flying through the air with an amazing view over the perfectly still water of the lake, surrounded by the volcanoes is just superb. If you have a day to spare in Guatemala, just go zip lining! 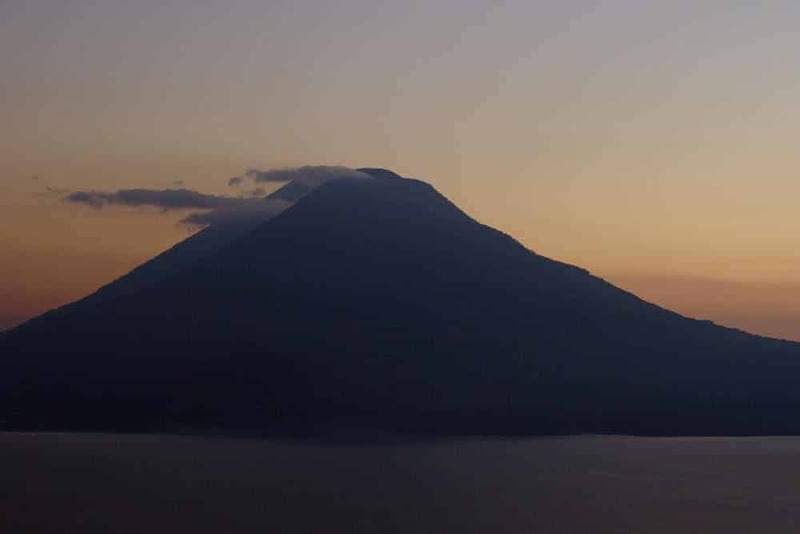 Lago Atitlan is surrounded by volcanoes. The lake itself is magical as it is, but the views from the top of one of the volcanoes are even better. San Pedro Volcano can be climbed from San Pedro la Laguna, but you can do a lot of similar hikes from different Lake Atitlan towns. Check out this stunning overnight hike to the summit of San Pedro Volcano. We heard the climb is heavy and difficult to do. That’s probably why it has the most scenic views. But there are a lot of other options and summits in the area. From Lake Atitlan, you can also hike up to a peak that resembles an Indian’s Nose. Ruinas de Iximche Tecpan isn’t far from the lake. We didn’t visit them yet. But if you’re into Mayan temples and don’t want to miss any. Iximche ruins have been inhabited until the sixteenth century and count over 160 structures. 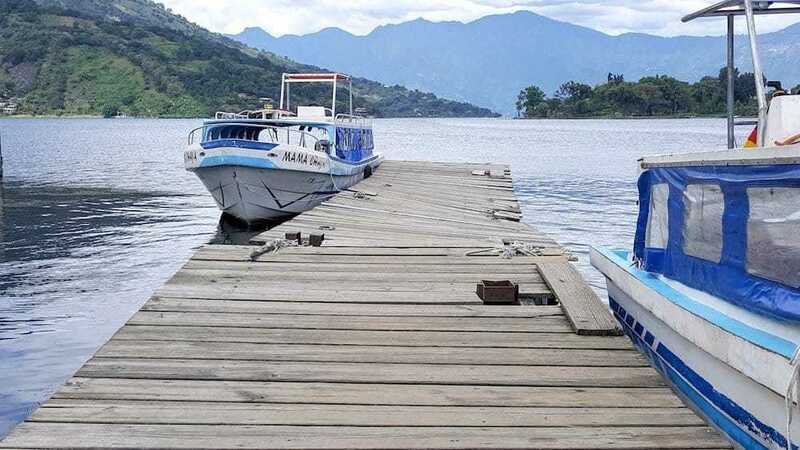 Lake Atitlan main travel hub is Panajachel, which can be reached in a few hours from Antigua, Quetzaltenango or any other city in Guatemala. Panajachel can also be reached straight from the Mexican border. Most people use chicken buses and collectivos / shuttles in Guatemala to get to Panajachel, but you can also use Pullman buses. 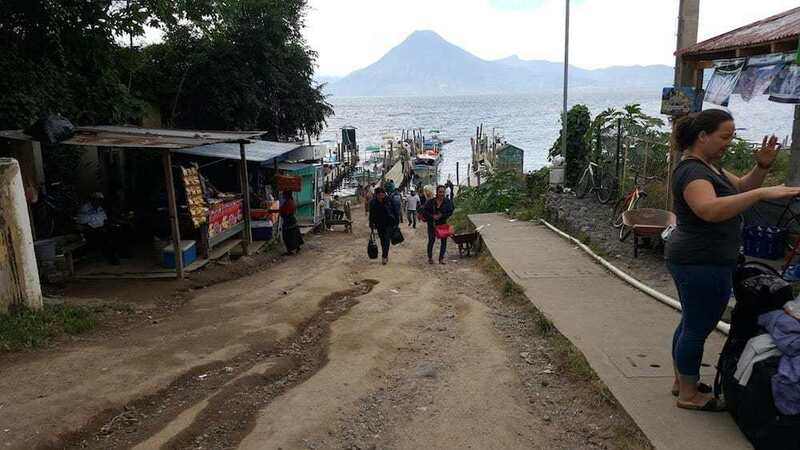 Traveling from Antigua to Lake Atitlan takes 4 to 6 hours, depending on the road condition at that time. A trip to Lake Atitlan can easily be combined with a trip to Semuc Champey and Rio Dulce. 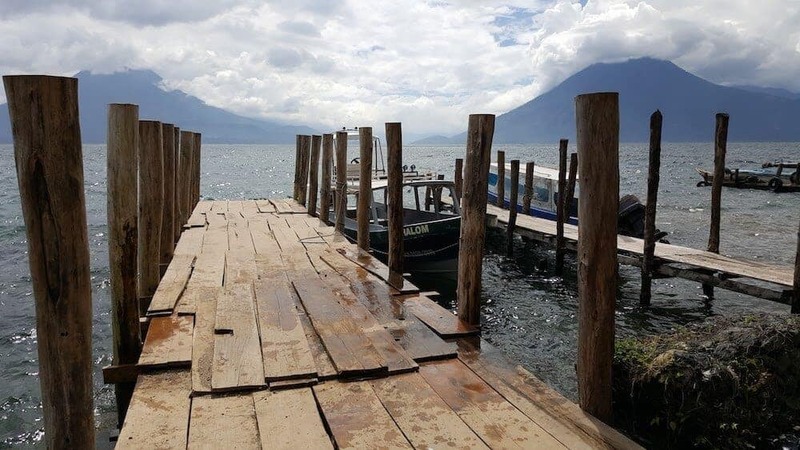 From Panajachel, you can take a ferry or lancha to any of the villages around Lake Atitlan. The easiest way to hop between villages is by boat. You can find docks just about everywhere and there will always be other people waiting to catch a boat ride. We never had to ask anything. Locals where very inclined to help us get in the right boat. Prices are a whole other story though. Since we were living on the lake for a few months, we knew what the price should be. We experienced on multiple occasions that prices suddenly went up, just for tourists. Ask in your hostel what the price for your trip should be and agree on this price with the boatman before you take off! Beware of being scammed in countries in Central America. 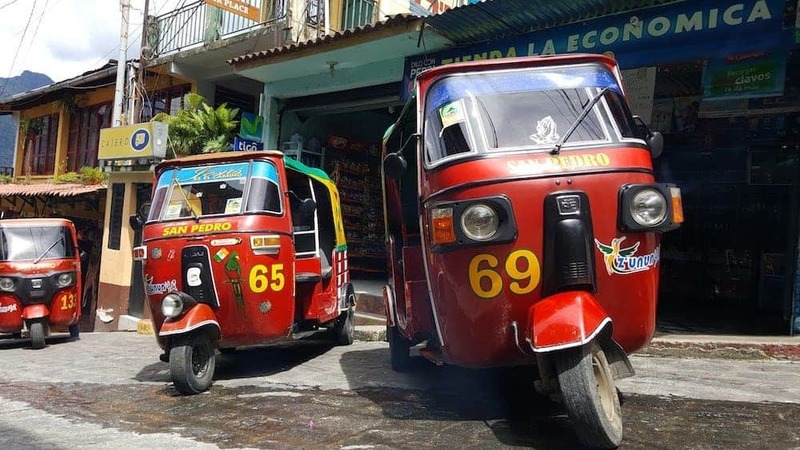 You can also get around with a tuk-tuk or just hop into the back of a pickup truck and pay the driver a few Quetzales. To use pickup trucks, you can just join the people who are waiting by the road and ask where they are going. They will gladly help you get aboard one of the vehicles. A third option to get around is to walk. It is recommended to check with your hostel staff about security. Let them know where you’re going and see how they respond. 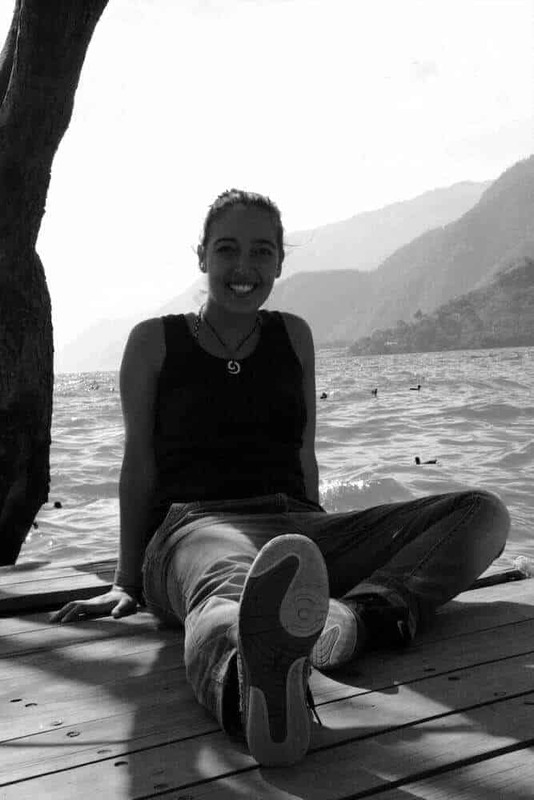 The most fun things to do in Lake Atitlan are relaxing and give you the opportunity to absorb the laid back atmosphere in the tiny rural Lake Atitlan villages. 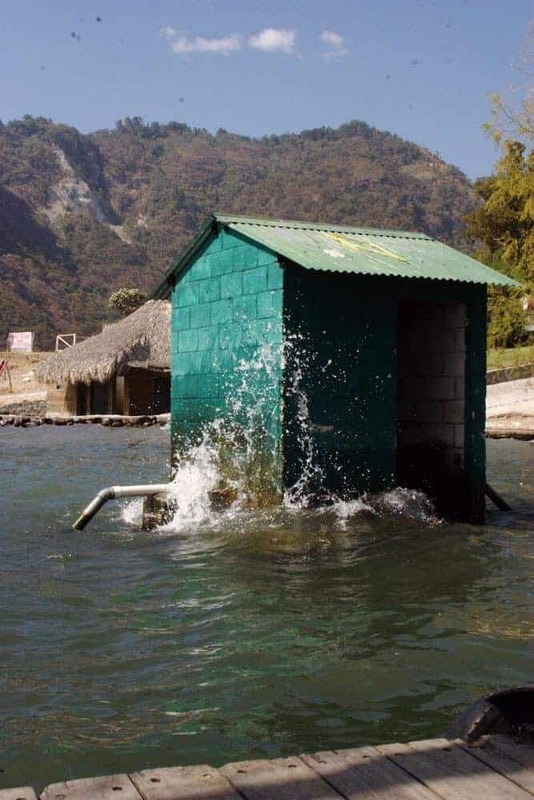 You should take into consideration that not all the Lake Atitlan towns have ATM’s. If you plan on shopping during a boat tour or visiting smaller villages, you should take enough cash. 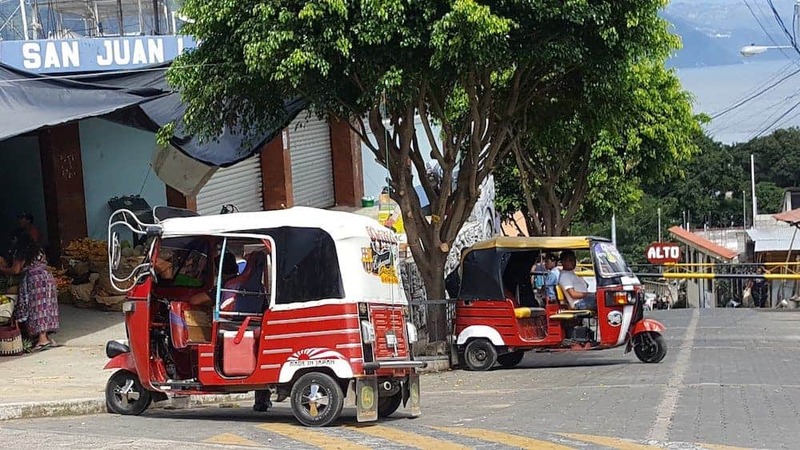 Panajachel and San Pedro have operational ATM’s for sure. Probably the other ones will follow soon! Have you been to one or more Lago Atitlan towns or do you plan on going there? Let us know or tell us what you know that we didn’t mention yet. We’re looking forward to your stories and adventures! Oh my gosh I am obsessed! 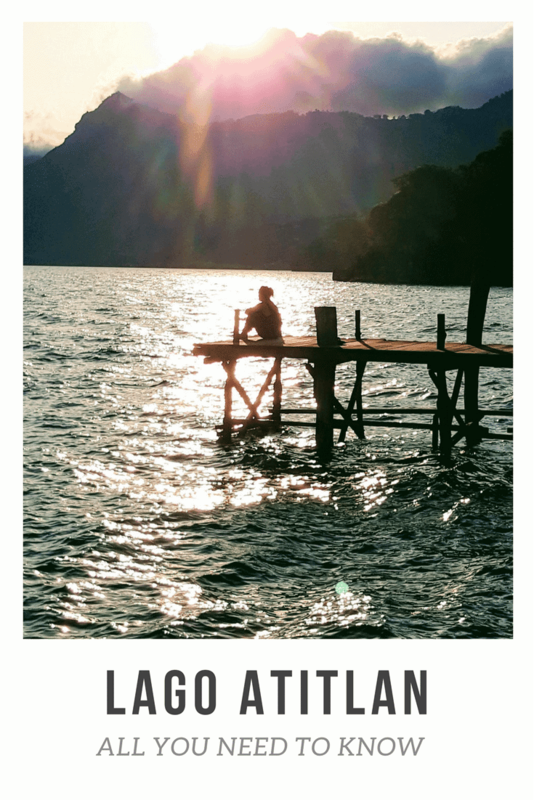 Your photos tell a story about Guatemala and of course this lake is stunning. I never thought of going there before but you’ve made me put it on my bucket list! All right! I’m very happy you enjoyed the article! We fell in love with Guatemala and recommend going there! Happy travels!